Are you looking for the perfect printer for your media or graphic design company, but can’t find anything that fits the size and quality of the images you need? Do you find yourself falling in love with one aspect of a copier but find that it falls short on important other things that you need it to do. Well, Xerox has the answer with its Phaser 7800 color printer! Never before has a tabloid printer offered this level of high quality printing from an in-house copier available to your business. This printer provides the highest quality prints used by marketing groups, digital companies, with stunning, reliable color that will impress all your clients, day in and day out. The Xerox Phaser 7800 offers photo shop quality without having to leave the office. The high volume capacity and consistently realistic looking photo prints make it perfect for even the most demanding jobs you can throw its way. 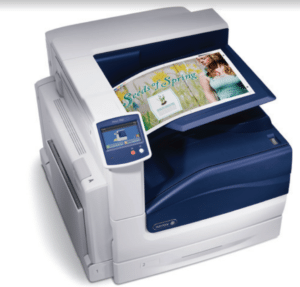 This printer is created for the most creative and design oriented companies and makes it easy to complete whatever job you need it to, from creating professional looking brochures, to printing photorealistic prints in-house, to unique media applications you can only find on the Xerox Phaser 7800. Our Xerox copiers at NYC Copier are always at the highest quality, and the Xerox Phaser 7800 may be the best printer on the market for media and design focused businesses in New York. Ask your NYC Copier representative to see if the Xerox Phaser 7800 is the right fit your all your business needs.